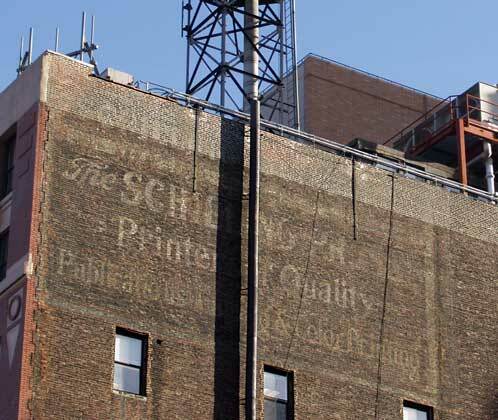 The Schilling Press was founded in 1906 on West 20th St. by Jacob H. Schilling (ca.1871-?) and Charles Frederick Schilling (1876-?). Presumably, the Schillings were brothers, but I have not been able to establish this definitely. They were both immigrants from Germany, Jacob in 1884 and Charles in 1891. The business moved to 137 E. 25th St., the 25th Street entrance to this building, in 1907. In 1921 the Schilling Press bought this ten-story building previously known as the Brackett Building. Schilling was in business at this address until the early 1940s. Edwin Emerson. Comet Lore: Halley's Comet in History and Astronomy, 1910. Horace E. Twichell. History of the Minisink Country, 1912. Acton Davies. Romance: a novel, 1913. Lois Fox. Carnation Petals, 1915. "A book of poems and thoughts". Gregory Mabry. Recollections of a Recruit: An Official History of the Fifty-Fourth U.S. Infantry, 1919. Raymond L. Thompson. A History of the Three Hundred Tenth Infantry, Seventy-Eighth Division U.S.A. 1917-1919, 1919. Felix J. O'Neill. Poems for Many Minds, 1931.